Comedian Samantha Bee, is stirring up some holiday controversy with the latest episode of her show "Full Frontal" on TBS, "Christmas on ICE." 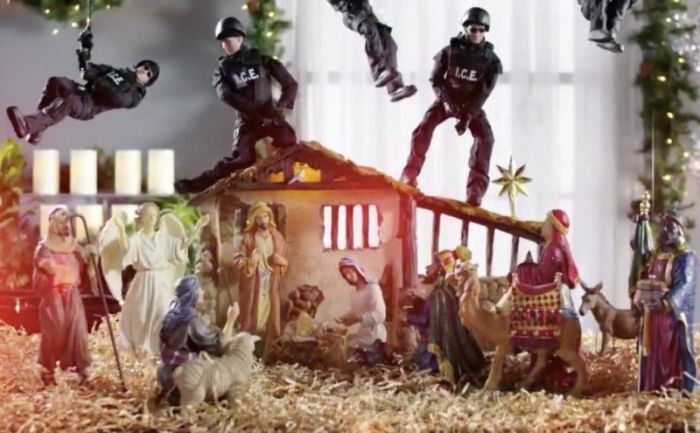 In a recent promotional video for her upcoming Christmas special Bee displays a nativity set being raided by dolls dressed as Immigration and Customs Enforcement agents. With "Christmas on ICE," the comedian is hoping to take a jab at the federal agency and President Donald Trump's stance to ban illegal immigration. "You know, Christmas is a time for families, even those families that we've separated, which is why I'm spending this Christmas on ICE," Bee is heard saying in the video. "Get it?" "Our special will raise money to help bring immigrant families back together, and we'll have all the traditions you've come to expect — joy, the border wall, special guests, the birth of the Christ child," she continued. The TBS host mocked the first lady Melania Trump's 2017 holiday decorations by recreating it all for her video. She said the Christmas special will raise money to reunite those families that have been separated at the border. Trump administration's "zero tolerance" policy led to children being separated from their parents who crossed the U.S. border illegally starting in June of this year. However, families who arrive at U.S. border entry points seeking asylum are not being separated from their children. Because of the 1997 Flores Settlement Agreement children can only be detained for 20 days before they're released to "the Department of Health and Human Services which places the minors in foster or shelter situations until they locate a sponsor," the DHS said in February about ending "catch and release." Bee, nevertheless is making her message clear on "Christmas on ICE" and concluded her advertisement by saying the U.S. "f***ed over thousands of immigrants and we still haven't fixed it. Merry Christmas!"